It’s hard to introduce one of your favorite role models in the world. Words don’t do her justice. Without delay, here is Dr. Sandy’s blog post “Choices, Skin Care Edition”. As you know, I am a big fan of Nina and Jarrard Copeland. They are amazing human beings who make our world a better place to live. Instead of singing their praises for the rest of Nina’s blog, I will state that I wanted to write another blog post for Nina to free up some of her time to deal with some of the challenges life has dealt them currently. They have a lot of inner strength and as usual, choose to take the high road. I am still reflecting on life and life choices. Sometimes we get to choose in life and sometimes life chooses for us. How we choose to deal with life determines our character. Nina and Jarrard have impressive character. Since childhood, I have been self-conscious about my crooked teeth. Our dentist told my parents that braces were not needed…..and they believed him. Not so pretty dentition greatly impacted my life. As I age, I think my teeth have become more crowded. So….I chose to get braces at the same time our children have braces. This means that I am choosing to have braces for 3 years during my mid-40s. I know that my teeth are already moving and I will be happy when the braces are removed. I know that I chose this. The awkwardness and other consequences however of wearing braces is more than I anticipated. Reflecting on this choice, I realized that I am a patient and consumer of health care instead of my usual role of being the health care provider. This process has made me even more sympathetic towards my patients. Health care choices can be overwhelming. “Cosmetic” choices can carry even more emotional ramifications. I however look at things differently than most people. I believe that our life is God’s gift to us and what we do with it is our gift to God. We must always give and do our best with everything. When it comes to our bodies, we are taught that we are temples of the Holy Spirit. I want to keep my temple looking good until God calls me home. This is why I try to eat well, exercise, get enough sleep, drink water, use sun protection, minimize stress, etc. This is also why I color my hair and use good skin care. This is also why I got braces. This is also why I go to experts for my care. This is why Nina injects 50 units of Botox into my upper face every 3 months and she injects 1 syringe of Voluma every 6 months into my cheekbone area. This is also why one of our laser techs treats me “as needed”. This is also why I continue to study skin care. God made the skin the largest organ of the body. And since I think one of the gifts God gave me is a passion and love for skin, I want to share with you some of my thoughts about skin care. I hope you love the skin you are in. I don’t want you to feel uncomfortable about your skin because I know how uncomfortable I felt/feel about my teeth. So to start, be nice to your skin. We take an oath in medicine to first do no harm. Treat your skin with love and respect. Why would you want to scrub, pick, dig, your skin? Why would you want to change the color of skin that God gave you by tanning and therefore cooking your skin? Why would you trust your treatments to someone less educated and passionate about skin? Last blog, I shared with you that I was honored to spend the weekend with international skin care experts and researchers on the Allergan campus. Until this weekend, I have believed at a minimum one needed sun protection during the day to prevent damage and retinol at night to repair damage. Other specialty products are added as the need arises. Such as TNS/growth factors to build up your dermis or lytera to diminish discoloration. I now also believe hyaluranic acid is needed to restore the epidermal barrier. Dr. Vega and her team are superstars. They did not quit after developing the best retinol ever. Last year, they developed a Superscreen called TD&R for total defense and recovery. This product not only protects against UV damage but also protects against IR radiation AND has antioxidants. It prevents new damage and reverses existing damage at the same time. I no longer have to preach wear your sunscreen—people want to use this product! For what you get, it is an amazing buy. I am such the bargain shopper. The price is high if you consider it a sunscreen. But when you take into account that it blocks UVR, IR and reverses damage—it is a steal. So now about hyaluronic acid (HA). We all know that hyaluranic acid is the current fad when it comes to skin care. We know that our body makes less of it as we age. We know that it is important for our epidermal barrier. We know it makes our skin look radiant and less wrinkled. We know that it is too large to penetrate into the skin. We know that most available products only last on the skin for 1-2 hours. What we didn’t know until these scientists did their homework is that an extract from the Vitis flower can penetrate the skin for the skin to produce its own HA. Amazing! So they developed a product that overtime (at least 2 skin cycles) will stimulate your body to make hyaluronic acid. Since they know that some people want to look “instantly ageless” (even though those claims make me cringe), they mixed this Vitis flower with other antioxidants and 5 types of hyaluronic acid. This allows my skin (and yours) to feel amazing not for 1-2 hours but for 8-12 hours. Also, with continued use, our skin will feel “forever young” by training the skin to make more HA. If you are interested in learning how to better take care of your skin AKA your window to your soul AKA the biggest part of your temple, then I encourage you to come visit one of our excellent JD team members. One of JD’s finest would love to prescribe a personalized plan just for you. Use our education and passion for your personal benefit. Thank you Nina for allowing me to share my thoughts for the past 2 weeks. I doubt you will choose to go another week without sharing with your followers your own thoughts and choices. Thank you who have read my posts the last 2 weeks. One of the last things I say to my kids before we part is “I love you and make good choices”. So until next time, make good choices, take care of your temples and Stay skintastic! Thank you Nina for allowing me to share my thoughts about choices with your readers. With gratitude to our patients who trust us with their skin care, especially their aesthetic skin care (products, Botox, fillers, laser, etc) (Dr.) Brad and I are spending the weekend with international experts in Dermatology and skin care. We were invited by Allergan to a VIP Summit this past weekend to view their worldwide headquarters and learn more about cutting edge skin care. This VIP Summit was comprised of Allergan leaders and a handful of physicians from the United States and Canada who they consider the top leaders in skin care. It is an amazing weekend. Not only did I get to spend the weekend letting out my inner science nerd, but the weekend also provided me the opportunity to reflect on the choices we make in life. I have been very reflective about life choices lately. This may be for a few reasons. One is that we have two teenagers who have to make important (and not so important) life choices on their own every day. Also, this year marks my 20 year anniversary of becoming a physician and the 10 year anniversary that Johnson Dermatology has been open for business. Aside from choosing with whom to share your life, I think choosing your career path is one of the most important choices in life. I have been blessed to be able to do what I love. I feel that I was called to be a physician and more specifically a dermatologist so there was no choice to make here. However, about 15 years ago when Brad was finishing residency, we had to choose where we were going to work, live and raise our children. He wanted to return to his hometown of Greenwood to live. I however considered a job at Amgen in California where I could do more research. I also considered staying on faculty at UAMS in Little Rock. I lastly reconsidered my original pre-Brad plan of returning to my hometown in Ohio and practicing with my mentor Dr. Bob Brodell. In the end, I/we made the right choice. We went back to Ohio while Brad completed a 2 year skin surgery and skin cancer surgery fellowship then moved to the Greater Fort Smith area to open Johnson Dermatology. Obviously, this was the best choice for me, him, and our family. some of the people who are with us now know and more than I will ever know—they make me and our clinic better. I love that all of our other providers Dr Brad, Dr Amy, Honey and of course Nina love skin almost as much as I do. I love that Shelly now manages more of the clinic. I love that Dani has excelled in her role as cosmetic coordinator; she gets almost as excited as me when a person feels better about themselves when their outer beauty finally matches their inner beauty. I could go on about each team member, instead I will say that we have an amazing team. Together we all strive for excellence in providing the most effective, efficient, empathic and empowering care. We know that every choice matters. My hope for you (me and all of us) is that not only do you make the “right” choice but that you feel good about your choices now and in the future. I most likely wrote too much for a blog. If Nina and her skintastic bloggers however allow me, I will write again and share some of the amazing things I learned this weekend.When you are faced with a choice about your skin or skin care, please know that the JD team is wanting, willing and able to help you with your choices. When you look back on all of your life choices, I hope that you think your life might be different but not better. Stay skintastic! Thank you Dr. Sandy for being a mentor, role model, friend and boss to me. This post was something I know my readers will enjoy. This past week we lost my Father-In-Law and it is during these difficult family times when you realize just how important the choice of career is to your life overall. How blessed am I that Dr. Sandy and the team at Johnson Dermatology wrapped their work family arms around me? The choice to work at Johnson Dermatology is one I would make over again a hundred times, one I look back on and know that my career could be different but certainly not any better. Johnson Dermatology staff recently attended a communication workshop. We are always striving to be better and communication is important for a successful team. During the workshop we discussed the “100 days of happiness” challenge. Essentially you challenge yourself to decide on one thing that makes you happy every day for 100 days. I thought to myself “welp, I’m happy already so no need to waste time on that activity”. I’m blessed with healthy family and friends and happy to say I have many luxuries such as a good job, good looks and good wardrobe. What more could a girl ask for? But as I often do over my morning cup of coffee I reflected on the meeting and the happiness challenge. I thought to myself “Who couldn’t be happier?” and “Could I be happier?” and realized that there is always room for improvement. Even though I am content right now, that doesn’t mean I couldn’t be happier. Then, as I perused my social media I saw where one of my team members started the challenge. It made me smile. It made me happy to see someone recognizing the things that are good in life. It gave me a warm, fuzzy feeling to see someone whom I care about sharing their happiness. At that moment she made me realize that the happiness challenge isn’t just for yourself, it’s also to spread happiness and joy. So if you haven’t figured it out yet I’m accepting the challenge. But instead of the next 100 days I’m going to bring happiness to my blog. From here on out at the end of each blog post I’m going to post something that makes me happy. I hope it doesn’t come off as annoying or obnoxious but instead spreads happiness and brightens someone’s day. To kick off the happy challenge here are some tips to keep your skin happy. Sun Protect. Angry skin is tan or even worse, sunburned. Keep your skin happy by using sun protective clothing and sunscreen this year. Moisturize. Dry skin can itch, burn, crack and be prone to infections. Get a plain white thick cream that comes in a jar such as cetaphil, cerave or vanicream and layer that stuff on thick especially when you get out of that shower while your skin is still moist. Gently cleanse. Only use plain gentle cleansers. Cleansers with scrubs and beads or exfoliators will not make for a happy camper. They can cause redness and inflammation of your skin. Throw away your magnifying mirror. If you can’t see small imperfections with a regular mirror neither can anyone else. Happy skin is self confident. Get naked and get checked. See a dermatologist this year and get your skin cancer exam. We look you head to toe and make sure we don’t see any skin cancers or health issues with your skin. Your skin is the largest organ of your body. Get a wellness check to help keep it happy! I hope you all have a very happy 2016! P.S. Today my happiness is brought to you by my husband who just did bath time with my kids all by himself! Latisse is a prescription topical solution that you apply to your eyelashes to make them thicker, longer and darker. 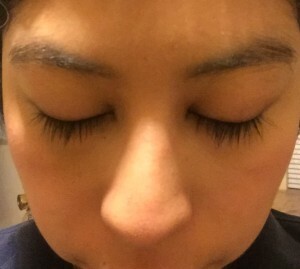 I never used Latisse because I thought my lashes were already dark, thick and long. But a few months ago I started applying Latisse to my brows and with what was left on the brush I put on my lash line. I have had so many compliments on my lashes that I am currently obsessed with my new lash look. 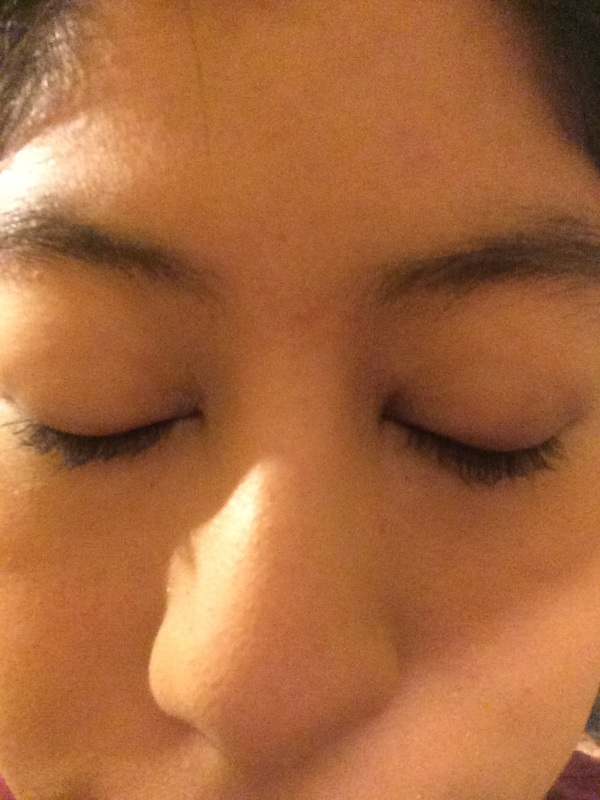 This week our skin care consultant Kyana blogs about Latisse, her favorite product. Kyana is a shining star. She has an infectiously sweet smile. She always has a positive attitude and will most certainly be someone that genuinely gives you the “feel goods”. She is someone that I truly enjoy being around at work because she brightens even the gloomiest of days. I hope you all have a little better day after checking out at Johnson Dermatology with Kyana. This weekend read what she has to teach us all about Latisse. From Kyana…..
Latisse is by far one of my favorite skin care products. I truly believe that first impression is crucial in our everyday life. One morning I came in to work and in less than 7 seconds Nina said “I love your skin!” This gave me confidence for the rest of the week. Every interview I have been on has taught me that I have 7 seconds to make that “wow” factor. Now all my first impressions are telling me how long and beautiful my lashes are since I started using Latisse! Latisse takes 16 weeks to see optimal results. It makes the lashes thicker, darker and fuller. It’s made by the Allergan Company and they have a loyalty program called Brilliant Distinctions. When you get your Latisse at Johnson Dermatology you will earn 150 points with the purchase of a 10 week kit and that is a $10 coupon for your next purchase towards the SkinMedica skincare line, Botox, Juvederm or Voluma. Patients ask us all the time about the difference between Latisse and eye extensions so I would like to explain the differences here. Eye lash extensions: They can range from $150 to $500 for first set. It takes up to 3 hours scheduled time to have the first set of lashes put in place. They last about 3-4 weeks then you can schedule monthly maintenance appointments that typically last about an hour. When looking for a professional lash expert, make sure the adhesive glue is FDA approved. Sometimes lash adhesive glue can cause irritation on eyes. After the lashes are in place there are care instructions. Depending on the type of lashes, your lash specialist will tell you how to take care of them. For about 24-48 hours you cannot get them wet or rub them. You will need to use oil-free based products. They are artificial and range in length, color and thickness. Latisse: At Johnson Dermatology the 10 week kit costs $179. According to www.GoodRx.com ,(a website that helps you find local drug prescription prices cheap, highly recommend) Walgreens sells the 10 week kit for $188. Be careful because the lower prices at local pharmacies are usually the 5 week kit so verify size of bottle when you price check. Latisse is easy to use. The kit consists of brushes and the Latisse bottle. Put one drop on the brush and swipe along lash line. We recommend using it in the morning although it is okay to use at night too and it takes less than a minute to apply. After you have applied daily for 16 weeks, apply once to twice a week for maintenance. If you choose either Latisse or Lash Extensions please research the pros and cons! Allergan is currently having a special, if you buy the 10 week kit the company Allergan will send you a free 5 week kit which will complete the 16 weeks. Come see me anytime to talk about your lashes! Latisse is a prescription you will need from one of our providers but any of our skin care consultants can assist you with any questions. Kyana after Latisse daily for 16 weeks and now on maintenance. Thank you Kyana for this excellent guest blog post. I have so enjoyed hearing from all of our skin care consultants on my blog. Hope you all enjoyed the series as much as I have. See all you shining stars this week at the clinic! The next contributor in our skincare series is the backbone of skincare products at Johnson Dermatology. She’s not only our office manager but the head of products. She does so much research on products that I often times use her as a reference. She is such a wealth of skincare product knowledge that when she agreed to write a post on my blog I blushed I was so honored. Shelly is excellent at helping our patients decifer labels and find the truth about their skin care products. I asked her to write some suggestions on how to choose skin care products and not get fooled by all the hocus pocus marketing ploys. So without further delay, here are Shelly’s Tips and Tricks of picking products for your skin! It amazes me in today’s society with all of the access to information that so few people are aware of the basics of skincare and how to find a truly good, effective product for their skin. There’s a lot of trendy, fun information on facebook, instragram, snapchat, you tube, beauty blogs, etc. Just like everyone else, I get sucked in to reading the on trend things like the new smoky cat eye, the no make-up ,make-up look, and the official Pantone color of the year that the supermodels, movie stars and Kardashians of the world are flaunting. Sometimes, though, it is refreshing and comforting to know the classics and the basics that are timeless. Nothing is more timeless and classic than having great looking skin. I feel blessed to have learned from the best some tips on choosing the right skincare and I’m excited to share them with you. There is no need for a fancy, expensive moisturizer. Moisturizer does not make any change to your skin other than keeping it hydrated. Moisturizer is mostly water and a little oil or in the case of oil based moisturizers, mostly oil and a little water. I for sure do not want to overpay for water and oil since there are lots more fun things to spend my money on like new shoes or a cute, new outfit. I meet lots of people who are in love with their fancy, department store moisturizer because they truly feel it changed their skin. If your skin is dry the wrinkles look worse, a moisturizer may temporarily help the appearance of wrinkles causing you to feel like it did something. Think of rehydrating a raisin in a bowl of water to make it look more like a grape again. Retinol (physician or prescription strength) is what improves the texture of your skin. We say this over and over because it is the truth. Cleanser is another item that basic is better. Scrubby beads are a big no-no unless it is our AHA/BHA cleanser from Skinmedica with dissolving beads. Scrubby beads are so bad that they are actually in the process of being banned through legislation because they are harmful for the environment too. Medicated type cleansers may not be the best for your skin unless they were specifically recommended by your skincare provider. I like cleansers with less than 10 ingredients. At Johnson Dermatology, we have over 30 years of combined skin care experience. The exciting thing is we are still learning new tips and tricks for you. I get questions daily from patients about my opinion of the skincare products sold by their very sweet, dear neighbor who brought them a casserole when they had surgery. Our loyalties run deep to those who take care of us in our times of need. I am certain that your neighbor made a fabulous casserole which we would all find delicious. However, do you want to trust your skincare to someone who has little to no training when there is so much to learn about the health and optimal appearance of your skin? The same can be said for most of the products you will find at what I call the beauty superstores. You cannot typically find a product that has strong enough active ingredients to cause long term skin changes unless you purchase it from a physician who is allowed to sell physician grade skincare. Proper use of strong, effective skincare requires patient education which is why you cannot find it in these places. Sunscreen is an absolute must. This is the cheapest antiaging product available. I recommend a physical sunscreen over a chemical sunscreen. It is better protection and less irritating. You need to look for zinc oxide and titanium dioxide, spf of at least 30, and UVA/UVB protection. Infrared protection is the latest and greatest in this category. It protects against the deeper penetrating rays that contribute to aging and damage. This will be harder for you to find unless you are in the know about Skinmedica’s TD &R. This is a win/win product since it provides this protection as well as antioxidants to help repair the skin. For those with oily/acneic skin, mineral powder sunscreen is great. And last but not least, complicated is not better. I am asked frequently to evaluate various skincare lines. One of the things that will get an automatic strike from me is the lines that have more than 4-5 steps morning or evening. If I am considering that many steps, I am probably in denial of the need of a procedure and trying to achieve procedure level results at home with product. Trust me here; I am not going to get that type of results with cream and neither will you. Plus, I have better things to do with my time than stand in the bathroom for an hour applying 10 different lotions, potions, serums and creams. WOW Shelly! You amaze me every single little skin day of my life! Happy New Year everyone! 2016 is going to be the best year yet!